Atheism: Proving The Negative: It's Out! Amazon is showing it as out of stock, but that should change this week? Will a Kindle version be made available? Oops never mind. Just found an earlier post where you confirmed this would be the case in the comments. Amazon.com is currently giving me an estimated arrival date of between October 03, 2012 - October 16, 2012 for my pre-order. I came across a neat atheist band with a 60K word codex explaining their new album. 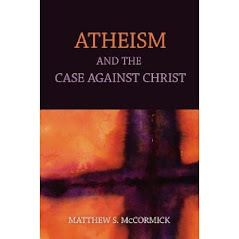 Dr. McCormick, your atheism course is very intriging. In the sense that your requirements affecting every little detail of the course show us what a controlling nature atheists have. Whats funny, is that atheists...after telling us there is no god to tell us what to do...invariably try to, you guessed it, Tell. Us. What. To. Do. And your remarks about "immoral" belief, coming from a Moral Relativist, are truly hilarious. You are either out of touch or just making stuff up outright. Thanks for sharing this information, i truly love your weblog. Keep this good work & enlighten us with your new post. Thanks.